Very comfortable. Easy to wrap up in. Save the planet while you sleep with EcoPure's Down Alternative Blanket. 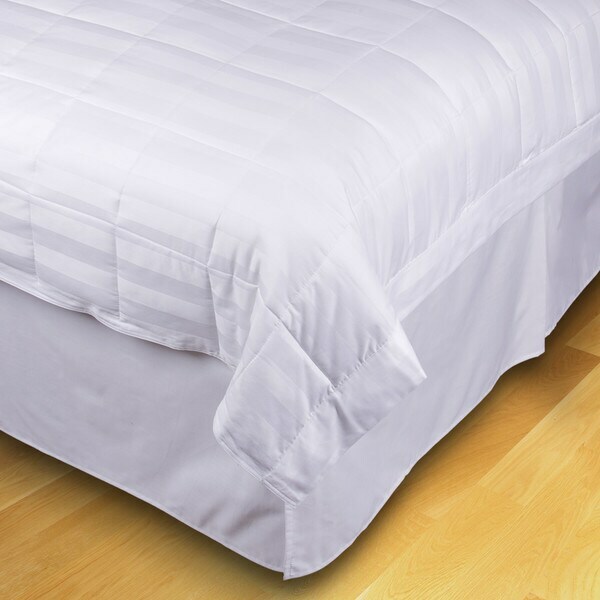 The soft, 240-thread-count blanket features a 100-percent recycled fiber fill and a 100-percent cotton fabric cover. The 100-percent recycled fiber fill is crafted from an innovative, environmentally conscious process of extracting polyester fibers from recycled bottles. The blanket is machine washable and is available in Twin, Full/Queen, and King sizes. Excellent size and weight, perfect for summer. Love that it is made of recycled materials. Washes well. Nicely made and as described, I would definitely buy again, especially if it comes in a winter weight. I am so disappointed when I received it. It was stiff as a board so I just washed it thinking it would somewhat soften, It came out still stiff like one of those blue tarps to protect something from the rain and very wrinkly. No filling that you can see or feel. And my queen mattress is only 9" thick and it doesn't have enough at the foot to tuck in. It can only look exactly like the photo, except wrinkly Nothing about this is soft or cuddly! It may be good for the earth but not for humans. Can't even iron it for my guests bed because it's made from recycled plastic bottles and would probably melt. Not a fan at all. I bought this to use on a trundle bed for my son. The size is fine so is the weight. But the actual fabric is paper stiff, it’s noisy when moving, and it feels very rough. The other part I disliked a lot is that there is almost no fill in.l this and it may as well be a flat sheet, not a blanket. I love this blanket and the filling! It is just the right weight for keeping warm, but not hot. I would definitely buy this brand and blanket again. Love on the first night! Well made, PERFECT for Summer and I will use it as a blanket in the winter with my thicker comforter on top. My husband loves it because he is so warm natured. It's well made, very thin . I really ordered this as a blanket. But it is a light, thin comforter. It's not fluffy and doesnt puff up. If you are looking for one to have a puffy look, this is not it. We love it. Going to get another today! Ps, ordered the 800 ct Egyptian cotton sheets at the same time. Perfect pairing. A must have!! We love this! We were afraid it would make us too hot during the night but it didn't. It's perfect for our "cover up" blanket and the blanket under our comforter, when making the bed. This blanket is perfect! Very comfortable, stylish and perfect for the weather we are having right now in Chicago. It's light weight, and provides the right amount of comfort to help sleeping so much better. Love it and definitely recommend it. I just love this. Made of great quality.Would recommend this to all. I manage 34 luxury vacation rentals in Florida and this is my new 'go to' quilt. Previously used lightweight (c.3 tog) quilts from Standard Textile, which are excellent, but it's Florida and we really don't need the warmth. This is the perfect weight for the climate and has the added benefit of saving on AC as guests don't need to crank the temperature down so low at night to stay comfortable. Good quality for the price. Would purchase again. "what is the weight of this blanket"
The twin's ship weight is 3 lbs, full/queen is 4 lbs, and king size is 5 lbs.